Dozens of Palestinian schools are at risk of being demolished by Israel, the UN has warned, leaving children in the occupied territories even more vulnerable. At least 45 schools are now facing demolition by the occupying Israeli military, the UN office for the Coordination of Humanitarian Affairs (OCHA) warned on Sunday. 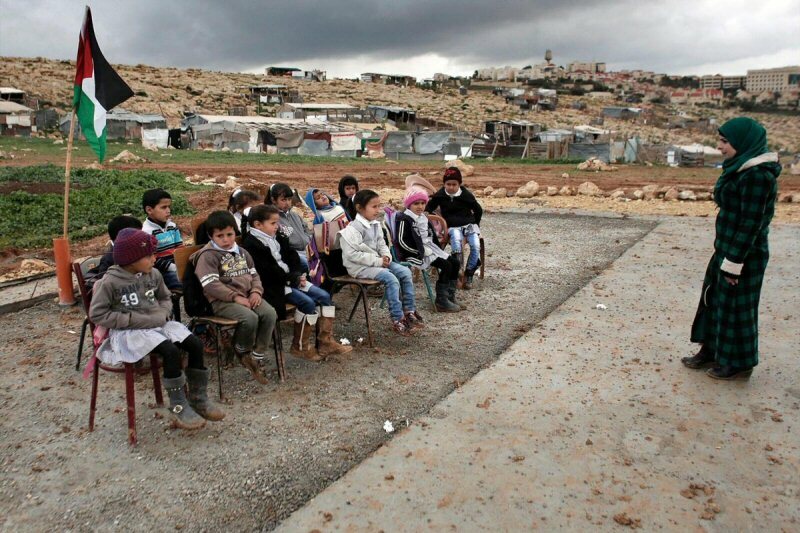 Children as young as seven would be left without schools if Israel carries out its demolition project, said Roberto Valent, acting OCHA coordinator for the occupied Palestinian territories. “I am deeply concerned by the Israeli authorities’ demolition this morning of two donor-funded classrooms – third and fourth grade – serving 26 Palestinian schoolchildren in the Bedouin and refugee community of Abu Nuwar, located in Area C on the outskirts of Jerusalem,” he said in a statement. Applications for building permits are known to take years to be processed, giving Israeli courts a loophole to accelerate Palestinian home demolitions by branding structures as “illegal”. The demolition of schools and homes in the occupied West Bank is a near-daily occurrence, with Palestinian families often forced to pay fees of up to $41,000 for the destruction of their homes. 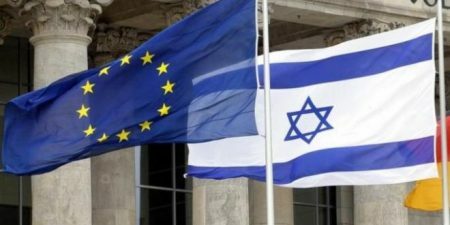 Construction of Israeli-only settlements, deemed illegal under international law, continues apace, with the full backing of Tel Aviv. Valent said, according to Days of Palestine: “The conditions it faces also represent those of many Palestinian communities have created a coercive environment that violates the human rights of residents and generates a risk of forcible transfer. Israeli forces continued with systematic crimes in the occupied Palestinian territory (oPt) for the week of 25 – 31 January, 2018. A Palestinian child was killed in al-Mughayer village, northeast of Ramallah, while 12 Palestinian civilians, including 3 children, were wounded in the West Bank and Gaza Strip, 11 of them with live bullets, and one with rubber-coated steel. During the reporting period, Israeli forces killed a Palestinian child in al-Mughayer village, bnortheast of Ramallah in the West Bank and wounded 12 Palestinian civilians, including 3 children, in the West Bank and Gaza Strip. In the Gaza Strip as well, the Israeli forces continued to chase Palestinian fishermen in the Gaza Sea and target border areas. In the West Bank, in new crime of excessive use of lethal force, on Tuesday, 30 January 2018, Israeli forces killed a 17-year-old Palestinian child when they moved into al-Mughayer village, northeast of Ramallah. According to PCHR’s investigations and eyewitnesses’ accounts on the last crime, at approximately 16:30 on the above-mentioned day, Israeli forces moved into the village and stationed in the center of it. A number of Palestinian children and youngsters gathered to throw stones and empty bottles at the Israeli vehicles. A soldier from one of the vehicles immediately fired one bullet that hit Laith Haitham Fathi Abu Na’im (17), entering his right eye and exiting his head. The wounded child was taken by an ambulance to the Palestine Medical Complex in Ramallah to receive medical treatment and admitted to the Emergency Department; however, he drew his last breath only minutes after. Eyewitnesses said that the bullet was shot at Abu Na’im at very close range, and he did not pose any threat to the life of the Israeli soldiers. On 31 January 2018, 2 Palestinian civilians were wounded when Israeli forces moved into Jenin and its refugee camp to carry out an arrest campaign. A number of Palestinian children and youngsters then gathered to throw stones and empty bottles at the Israeli vehicles. The Israeli forces immediately fired live and rubber bullets at them, wounding the 2 civilians. In similar circumstances, a child was wounded with a rubber bullet to the eyelid when Israeli forces moved into the eastern area in Nablus. During the reporting period, the West Bank witnessed protests against the U.S. President’s decision to recognize Jerusalem as the capital of Israel and move the U.S. Embassy to Jerusalem. During the protests, the Israeli forces used force against the protesters, and the shooting to disperse the protests resulted in the injury of one child in Sa’ir village, northeast of Hebron. The child was hit with a bullet to the foot and then arrested to be taken to an unknown destination. In the Gaza Strip, the border areas with Israel witnessed protests against the U.S. President Donald Trump’s decision to recognize Jerusalem as the capital of Israel and move the U.S. Embassy to it. During the protests, the Israeli forces used force against the protestors. Due to opening fire to disperse the protests, 8 Palestinian civilians were wounded, including a child, with live bullets. Four of them, including the child, were wounded in Northern Gaza Strip; 3 in central Gaza Strip; and one in Khan Younis. As part of targeting fishermen in the sea, on 27 January 2018, Israeli gunboats heavily opened fire at the coast line. On the same day, the gunboats opened fire at the fishing boats off al-Sudaniya shore, west of Jabalia in the northern Gaza Strip. The shooting recurred on 30 and 31 January 2018. As part of targeting the border areas, on 28 January 2018, Israeli soldiers opened fire at the shepherds, east of Gaza Valley village near the eastern borders of the village. However, no casualties were reported. On 31 January 2018, Israeli forces stationed along the border fence between the Gaza Strip and Israel, east of Beit Hanoun, opened fire at the border area. However, neither casualties nor damage was reported. On the same day, the Israeli soldiers stationed along the border fence, east of al-Maghazi refugee camp, opened fire at the agricultural lands in the eastern areas. The shooting recurred in the same area many times, but no casualties were reported. As part of demolitions in favour of the settlement projects, on 30 January 2018, Israeli municipality staffs in Jerusalem demolished 6 barracks and 9 commercial and agricultural facilities in al-‘Issawiyah village, northeast of the city. Mohammed Abu al-Humus, Member of the Follow-up Committee in the village, said that the Israeli forces accompanied with staffs from the municipality and Nature Authority moved into the aforementioned village and demolished the facilities in favour of the national parks in the village. As part of house demolitions, on 29 January 2018, Israeli forces accompanied with 5 bulldozers moved into Beir ‘Ounah area, west of Beit Jala, and demolished two under-construction residential buildings in the area under the pretext of non-licensing. The first building belonged to Walid Rezeq Zarinah and was comprised of 4 floors with 8 residential apartments while the second belonged to Mohammed ‘Abdel Hadi al-Hroub and was comprised of 6 floors with 12 residential apartments. The demolition of those buildings revealed the Israeli forces’ intention to carry out further demolitions in the area, which is full of residential apartments mostly resided by civilians holding Jerusalemite IDs. It should be mentioned that Beit ‘Ounah area and al-Weljah village adjacent to the southern borders of occupied Jerusalem are systematically exposed to demolition campaigns to force the residents to leave the area and annex it to the settlements established on Palestinian lands there as part of the “Great Jerusalem” project. The Israeli municipality in Jerusalem also exerts effective influence over these areas, demolishes houses built without obtaining licenses which are never issued to the residents, and imposes property taxes on the other residents of the area. On the same day, Israeli forces accompanied with vehicles belonging to the Israeli construction and organization Department in the Civil Administration moved into al-Hemarah area in area (C), east of Bet Dajen villages, east of Nablus. They handed owners of 3 houses demolition notices though the cases of those houses are pending before the Israeli courts. On 31 January 2018, Israeli forces moved into Irfa’iyah area to the east of Yata, south of Hebron. They dismantled a house built of tin plates on an area of 80 square meters on the house roof of Kamel Rab’ie al-Qadeem. At approximately 14:00 on Thursday, 25 January 2018, a number of Palestinian youngsters gathered at the entrance to Beit ‘Oyoun village, east of Hebron, which connects Sa’ir and al-Shuyoukh villages with the Bypass Road (60). The protestors threw stones at Israeli vehicles stationed at the abovementioned entrance. The Israeli soldiers opened fire at the protestors and chased them between houses. 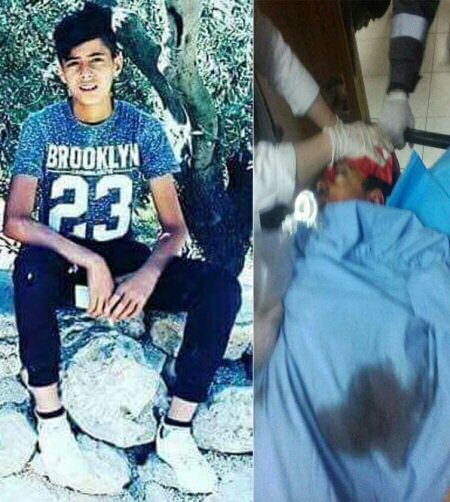 As a result, Ahmed ‘Essa Shalaldah (16) was hit with a live bullet to the foot and was transferred to an unknown destination. At approximately 13:00 on Friday, 26 January 2018, dozens of Palestinian civilians gathered near the border fence between Israel and the Gaza Strip, east of Khuza’ah and ‘Abasan al-Kabirah and al-Jadidah villages and al-Sarij area, east of al-Qararah, east of Khan Yunis in the southern Gaza Strip, in protest against the U.S President Donald Trump’s declaration of Jerusalem as the capital of Israel. The clashes continued in the area for hours during which the Israeli soldiers stationed along the border fence sporadically fired live and rubber bullets and tear gas canisters. As a result, an 18-year-old civilian sustained a live bullet wound to the right leg. At approximately 13:30 on the same Friday, dozens of Palestinian youngsters made their way to the border fence between the Gaza Strip and Israel in the northern Gaza Strip. The youngsters approached the security fence, set fire to tires, and threw stones at Israeli soldiers stationed along the border fence. The soldiers stationed in military watchtowers in the landfill area, north of the Agriculture School, north of Buret Abu Samrah, north of Beit Lahia, fired live bullets, rubber-coated metal bullets and tear gas canisters at them. As a result, 4 civilians, including a child, sustained live bullet wounds. The wounded civilians were transferred by ambulances belonging to Palestine Red Crescent Society (PRCS) to the Indonesian and Beit Hanoun Hospitals. Doctors there classified 2 civilians’ injuries as serious. At approximately 14:00 on the same day, dozens of Palestinian youngsters made their way to the border fence between the Gaza Strip and Israel, east of al-Buraij refugee camp in the central Gaza Strip. The protestors set fire to tires and threw stones at Israeli soldiers stationed behind sand barriers along the border fence. The clashes continued until the evening hours of the same day. As a result, 3 civilians sustained live bullet wounds to their lower limbs. On Tuesday, 30 January 2018, the Israeli Municipality staff in occupied Jerusalem demolished 6 barracks and 9 commercial and agricultural facilities in al-‘Issawiyia village, northeast of the city. Mohamed Abu al-Humus, Member of the Follow-up Committee in al-Issawiyia village, said that the Israeli forces accompanied with the staffs from the Israeli Municipality and Nature Authority moved into al-‘Issawiyia village and demolished 6 barracks used as stores, restaurants for drinks and fast food. Abu al-Humus also said that the Israeli bulldozers demolished 9 other facilities identified as a farm, fence, office, 2 barracks, 2 chicken coops, a car, and an agricultural room in the area threatened to be confiscated in favor of the National Parks in the village. 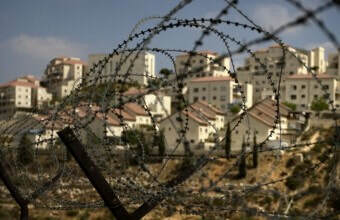 He added that the Israeli authorities raided other commercial facilities in the village and checked their papers. Moreover, the Israeli forces raided al-‘Issawiyia Medical Center under the pretext of examining a device. Abu al-Humus said that the Israeli forces confiscated vehicles parked on both sides of the road and removed other 20 vehicles under the pretext of mechanical faults. They also stopped vehicles and checked the passengers ‘IDs. The Israeli forces also raided a butcher shop, confiscated cartons of eggs and then threw them into the trash. On Monday, 29 January 2018, Israeli forces accompanied with 5 bulldozers moved into Beir ‘Ounah area, west of Beit Jala city. They demolished 2 under-construction buildings under the pretext of non-licensing. According to PCHR’s investigations and eyewitnesses’ statements, at approximately 08:00, Israeli forces moved into Beir ‘Ounah area, imposed a military cordon on the area, surrounded 2 under-construction buildings, and then demolished them. The first 4-strorey building belonged to Waleed Reziq Zarinah and included 8 apartments, while the second 6-storey building belonged to Mohamed Abed al-Hadi al-Hroub and included 12 apartments. The demolition of the abovementioned buildings showed the Israeli forces’ intention to conduct more demolitions in the area, which is full of residential apartments mostly resided by those holding Jerusalemite IDs. Furthermore, Mayor of Beit Jala, Nicolas Khamis, along with the municipality staff and the Palestinian Ministry of Local Government (MoLG) staff arrived at the area to reveal the circumstances. Meanwhile, a number of civilians assaulted the mayor, his companions, and the procession in protest at the demolition carried out by the Israeli bulldozers. The civilians hold the Mayor fully responsible for the demolition. It should be noted that Beir ‘Onah area and al-Waljah village adjacent to occupied Jerusalem’s southern borders are exposed to systematic demolition campaigns, which aim at deporting their residents and annex them to settlements established on Palestinian lands, under the so-called Great Jerusalem Project. The Israeli municipality in Jerusalem imposed its control on these areas, demolished houses built without licenses which are the municipality refuses to give the residents, and imposed a property tax on them. Saeid Ahmed Abu Jaish, whose one-story inhabited house built on an area of 150 square meters. At approximately 15:00 on Monday, 29 January 2018, a group of Israeli settlers gathered on “Yitzhar Settlement Street and Hawarh village’s Main Street, south of Nablus. The Israeli settlers closed the abovementioned streets and then threw stones for over 2 hours at Palestinian civilians’ vehicles and a house belonging to Bassam al-Najar near Yitzhar Street, south of Bureen village but no casualties were reported. It should be noted that the stone-throwing happened after the Israeli forces re-opened Yitzhar Street for Palestinian civilians’ vehicles. Yitzhar Street was closed following the killing of an Israeli settler by Palestinian armed persons on 09 January 2018.